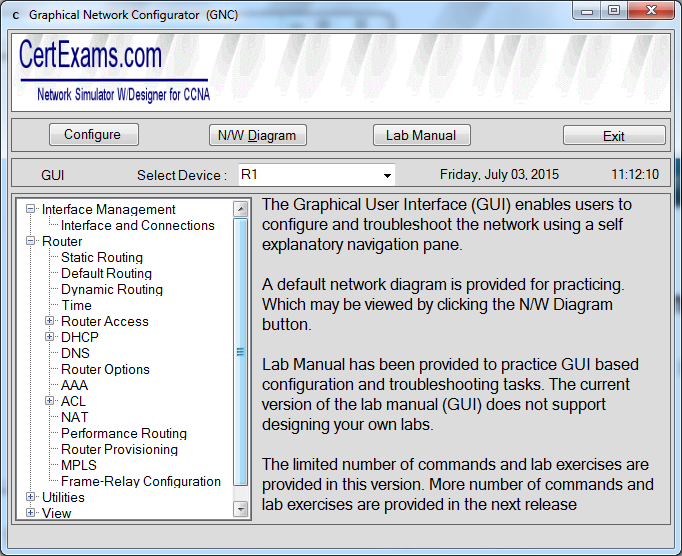 CCNA Network Simulator has been updated to include Graphical User Interface (GUI). 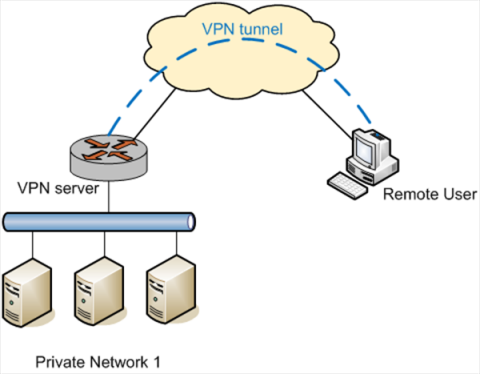 Conventionally, a network administrator needs to configure a router or a switch using CLI (Command Line Interface), with the exception of some Wi-Fi routers that allowed GUI configuration. Cisco, as part of its product enhancements, has been working on improving the user interface, and have come up with Cisco Configuration Professional, a GUI tool that allows network administrators to configure and troubleshoot Cisco network devices using a visual GUI interface. Certexams has introduced a limited version of the GUI based Network Configurator that allows users to do mundane tasks such as assigning IP addressses and subnet masks, setting up DHCP, assigning host name, etc. The GUI is intended to provide some hands-on experience of working with CCP (Cisco Configuration Professional) and simulates the CCP navigation. A typical screenshot of the feature may be seen the figure. As seen in the figure, the GUI consists of a left pane that outlines the configuration tasks, and when selected, the right pane provides the work area, where the user may select or type-in appropriate configuration. 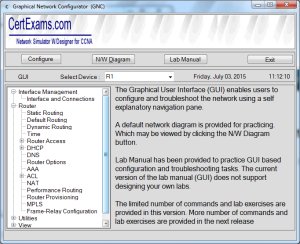 Several labs have been given to familiarize the user to configuring the network using GUI. However, this being the first release, more enhancements may be expected to Network Configurator. More configuration tasks, as well as new labs will be added in due course of time. The software is completely stand alone, and there is no need for any other software. Hundreds of lab exercises to get familiarized with concepts of routing, NAT, Access lists, subnet masking, etc. There is no hardware required, it s completely software based too. Please visit the product home page http://routersimulator.certexams.com/ccna-simulator-download/download-network-simulator-designer.html for more information, and free demo download. We have recently released a revised version of Cisco CCNA NetSim. 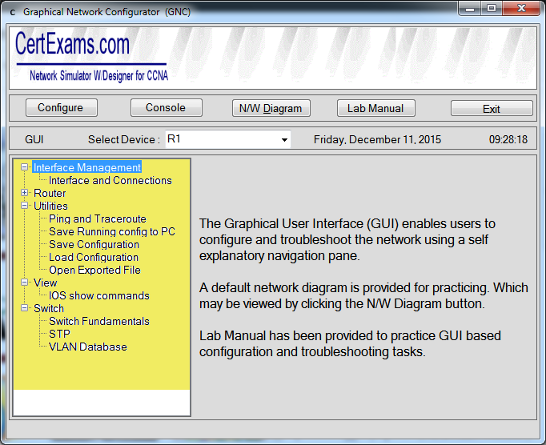 CertExams.com CCNA Network Simulator provides a simulated network environment for hands-on practice using virtual routers and switches. The recent revision includes support for Do command, and some debug commands. The “do” command allows running a privileged level command from configuration modes such as interface and global. – Lab exercises for hands-on practice. – Router and switch simulator. – Simulate Cisco® IOS routers (805, 806, 17xx series, 25xx series, 26xx series, and 36xx series) or switches ( 19xx, 29xx ). – Connectors available are Serial, Ethernet, IsdnBri, Frame Relay, Fast Ethernet. – Extensive Lab Manual is provided. – Support for 300+ router and switch commands. – Network designer that provides drag and drop feature for inserting devices and connectors. GUI based device configurator. You can type short form commands in IOS simulator for router/switch commands just like in actual router/switch. CCNA Certification is awarded by Cisco Systems on successful completion of qualifying exam(s). CCNA is intended for candidates who have just started working on Cisco ruoters and switches. 3. 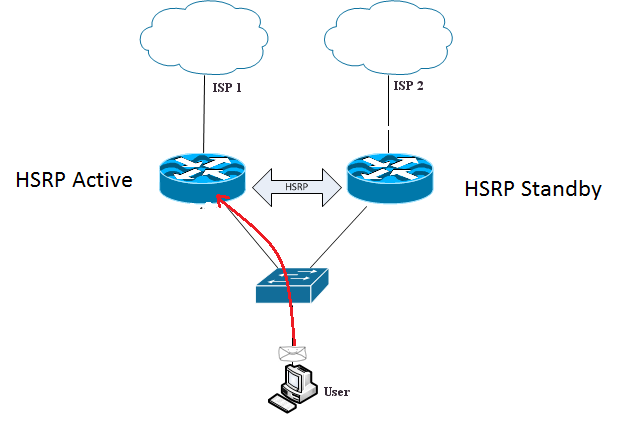 Implement an IP addressing scheme and IP Services to meet network requirements in a medium-size Enterprise branch office network. 7. Implement, verify, and troubleshoot NAT and ACLs in a medium-size Enterprise branch office network. 1. CCNA Exam Simulator: The only practice exam that provides complete range of CCNA question types including simlets and simulations. Note: These will be updated from time to time.